OMG Posters! » Archive Emek's All Points West Poster (Onsale Info) - OMG Posters! 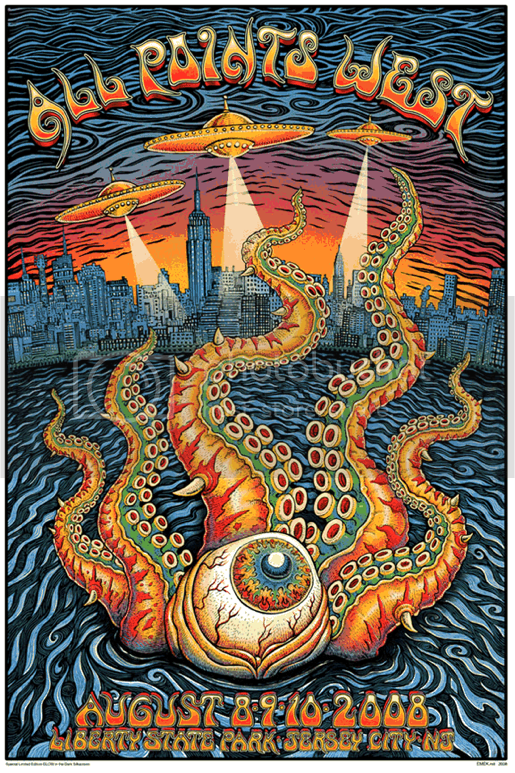 Emek is ready to release the artist edition of his All Points West screenprint he did last month. The artist edition glows in the dark, has an edition of 100, and will be $85. To purchase, visit the Store/Info link on Thursday, September 25 at 8pm PDT. Overseas customers can send Emek an email at 8pm Greenwich Mean Time on Thursday with the subject “APW”, he is setting some aside so that they don’t have to stay up all night. Visit Emek.net. Did you mean Sept 25? not to be too negative, but i don’t think many care what date the on-sale is. the show edition is bellow cost on ebay.